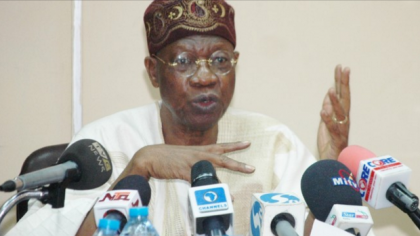 The Minister of Information and Culture, Alhaji Lai Mohammed has expressed concern over the dissemination of fake news and disinformation in the country. The minister said this Thursday night in Abuja when he paid a visit to the “The Labour Room’’, Nigeria’s first Reality TV show geared toward national development. The News Agency of Nigeria (NAN) reports that the reality show being hosted in Abuja assembles 37 youths, christened as “Governors”, selected from every state of the federation and the FCT at a location called “Labour Room Mansion’’. During the period of their stay, they are expected to analyse and x-ray the myriad of issues bedeviling the Nigerian state to articulate workable, sustainable, solution-driven recommendations for reform. The minister, who was fielding questions from the “Governors’’ on the challenge of fake news and disinformation in the country said that treasury looters were largely responsible for the menace. “Today, it is those who do not want to go to jail but have stolen our money and who are been prosecuted that are largely behind this fake news phenomenon. “They want to discredit the government so that the government will not win elections and they can come back to start doing what they are used to doing. “What are they coming back to do? Re-loot the money we have collected,’’ he said. Mohammed said that the President Muhammadu Buhari led Administration had succeeded in “driving corruption under the table’’. “Before, corruption used to be negotiated openly, but not again. Today, nobody can boast that he is a corrupt person in Nigeria again,’’ he said. The minister, who accused the Peoples Democratic Party (PDP) of sponsoring fake news on social media, said the party wants to come back to power because they wanted to cover up their tracks. Mohammed said, although fake news and disinformation were a global phenomenon, the government was worried and concerned about it. He said most Nigerians accessed their information from social media “and unfortunately, there is no rule of engagement on social media’’. “Before, we all know who a journalist is but today, anyone with a phone is a journalist. “Anyone today can go online, publish photographs and tell lies about the country,’’ he said. The minister said that the government was constraint because it did not want to make any draconian law that would restrict people from the use of social media. He said the social media had its good and bad part, adding that it was unfortunate that some unscrupulous persons were using the medium for negative ends. The minister also took time to brief the participants on the achievements recorded by the administration, in spite challenges. He said through discipline, determination and transparency, the government recorded landmark achievements that were putting the country on the path of sustainable growth. He said the administration had delivered and still delivering in the broad areas that form the plank of its policies: Security, fight against corruption and the economy. Earlier, the “Governors” briefed the minister on their mission and experiences in the house.